Meltfactor » Blog Archive » 2012 summer Greenland ice reflectivity, lowest since year 1150? 2012 summer Greenland ice reflectivity, lowest since year 1150? After a weeklong delay in data availability from a 61st satellite maneuver in 13 years to makeup low earth orbit drag, we find Greenland ice reflectivity (a.k.a. albedo) returning toward higher values, evidence of fresh snowfall accumulation and accompanying lower temperatures now as the melt season approaches its end. The latest average Greenland ice reflectivity (69.2%) from 13 August is at a level still below 1 standard deviation from the 2000-2009 10 year ‘climatology’. 2012 values are right on track with the previous record low year 2011. Apparently distinct from previous years in number and intensity of low albedo (evidence of melt) episodes, the 2012 melt season is characterized by 4 anomalous lows, centered on: 2 June (71.4%); 27 June (67.4%); 16 July (64.0%); and 1 August (65.2%). The albedo lows are punctuated by the brightening effect of snowfall events. There could be a late season melt episode as in 2004 or 2003. Below, a similar pattern is evident at the highest (coldest) 700 m (2000 ft) of the ice sheet. lowest albedo since year 1150? The 16 July low was the lowest in the satellite observational record and coincided with 97% of the ice sheet surface area melting. Previous maximum melt extent values since 1978 (when satellite obseravations begin, this is what NASA meant by “unprecedented”) are under 60% of the ice sheet area. Because the 2012 summer temperature was warmer than previous years (as I tweeted 5 August: June 2012, warmest on record for Greenland’s capital Nuuk since at least 1866 when continuous record keeping began, +7.2 C vs +4.3 C average), warmer than 1929 by at least 0.5 deg. C, and if the near surface air temperature records, continuous since 1840, are any indication (Box et al. 2009) this albedo anomaly and accompanying melt extent is probably without precedent since the Medieval Warm Period when the Norse settled Greenland. 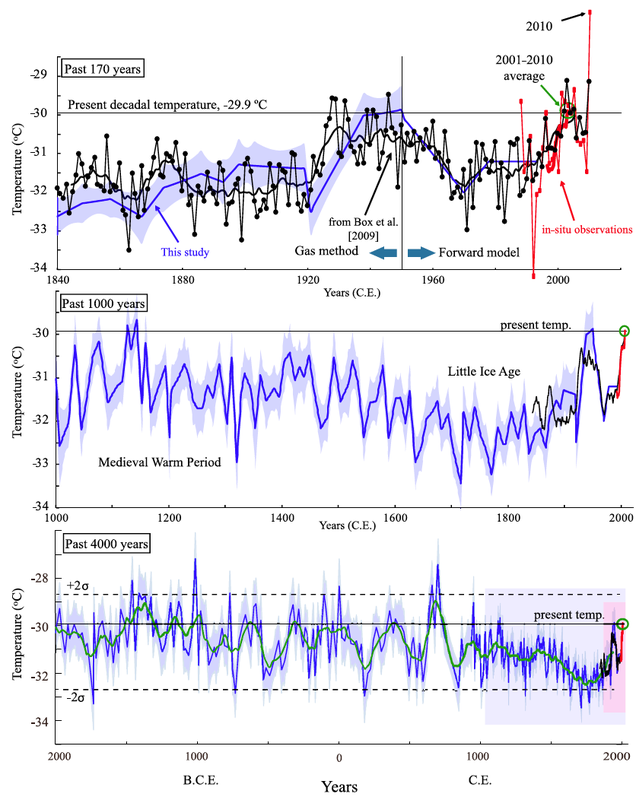 Greenland temperature variability is high and there is evidence during the late Medieval Warm Period of a warm period in year 1150, that is 862 years before present (Kobashi et al. 2011). Other factors than warming that could have temporarily lowered Greenland ice reflectivity include the effect of major volcanic eruptions or wild fires. The latter I speculated here. The former has a noteworthy cooling effect but could conceivably still blanket the ice sheet with low reflectivity soot. Kobashi et al. 2011 Fig. 1. This entry was posted on Wednesday, August 15th, 2012 at 9:56 am	and is filed under ice sheet melt factor. You can follow any responses to this entry through the RSS 2.0 feed. Both comments and pings are currently closed.